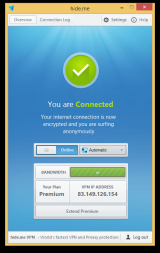 hide.me Windows VPN client is a unique solution with a set of exclusive features to make it prominent from the rest. This feature offers you the ability to pick your desired server with just a single click. It means in one click, you can connect to the most protected server location relying upon on your preferences. No more manual set-ups. With the Auto-Server, your connection speed is optimized as the client is clever enough to detect and connect to the quickest server. This feature makes sure that users do not spend too much time in finding the best server location. If the connection times out, or if it is stopped for any reason, this feature will directly reconnect you to your favorite server once the internet connection resumes. The integrated Auto-Connect feature helps you to directly connect whenever you shift on your system making sure your privacy at all times. The off switch option is added in the program as an additional layer of protection. This feature will obstruct all the incoming and outgoing traffic, if your internet connection drops. In most cases, users do not even realize that VPN has stopped working. Supports a wide variety of protocols. Supports a maximum of 5 simultaneous connections. There are some small issues regarding the IP location. The Premium plan is a little bit pricey. hide.me VPN has been tested by Download82.com team against viruses, spyware, adware, trojan, backdoors and was found to be 100% clean. Our editors will recheck this software periodically to assure that it remains clean.